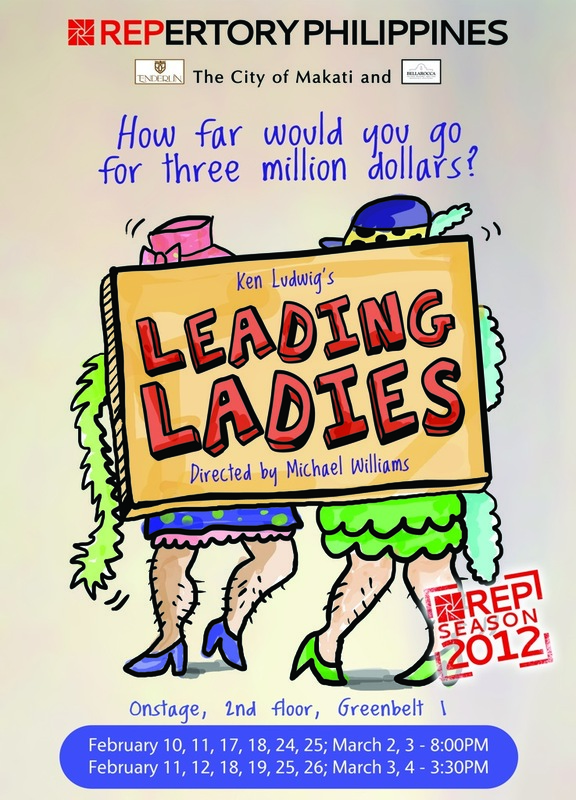 Repertory Philippines proudly presents the hilarious hit comedy titled Leading Ladies written by Ken Ludwig. It will make sophisticated and reasonable men and women of the 21st century cackle till their faces hurt. 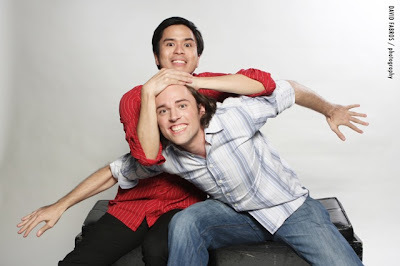 The play is showing on February 10 to March 4, 2012 at the Onstage at Greenbelt 1 in Makati City. 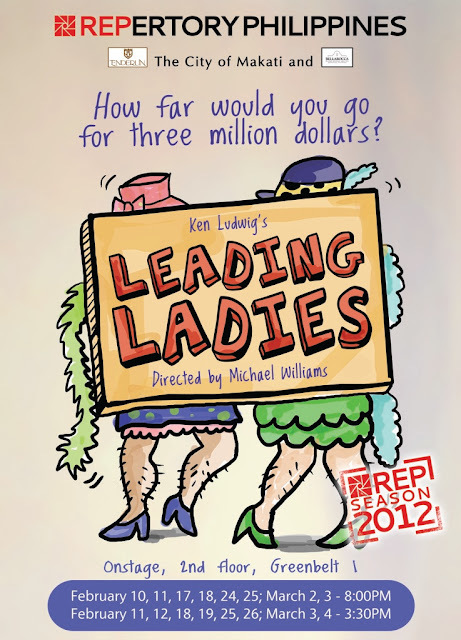 Leading Ladies is presented by special arrangement with Samuel French Agency. Co-presented by the City of Makati, Enderun Colleges and Bellaroc Island Resort and Spa. Leading Ladies is about Leo and Jack, two British actors whose careers are so far on the skids that they’re performing “Scenes from Shakespeare” on the Moose Lodge circuit in Pennsylvania’s Amish country. They think their luck might change, however, when they hear about Florence, an old lady in a nearby town who is about to die and leave a considerable legacy to her nephews from England. Leo convinces Jack that they should impersonate the heirs. Their foolproof plan hits a snag, though, when they arrive on the scene and realize the woman’s long-lost relatives are nieces and not nephews. Then it hits another obstacle when Leo falls in love with Meg, who’s engaged to a minister with plans for Florence’s money, while Jack crushes on Audrey, a ditzy blonde involved with the son of Florence’s doddering doctor. The ensuing shenanigans and problematic courtships naturally force the actors to hop back and forth between Jack and Leo and Maxine and Stephanie. Ken Ludwig has won numerous awards and several Tony nominations for his work. His musical Crazy For You ran for five years on Broadway and four years in the West End winning Tony, Olivier, Drama Desk and Helen Hayes Awards as Best Musical of the Year. Lend Me A Tenor (produced by Andrew Lloyd Webber) has proven to be one of the most popular comedies of the past 25 years, winning two Tony Awards. His work has been translated into 16 languages and performed in more than 30 countries. Noted theater actor and director Michael Williams directs Leading Ladies. He is celebrating his three decades in Philippine theater. Toots Tolentino (PR & Publicity) with Rem Zamora and Oliver Usison (PR & Publicity, Marketing), Marie Talay and Rose Silva (Marketing & Sales) and Dave Fabros (Photography). Leading Ladies is brought to you by the following sponsors: Ayala Malls, Business World, Ticketworld, Manila Bulletin, Her Word.com, Click the City.com, Lane Moving and Storage, Dot.ph, 105.1 Crossover, Jam 88.3, Yehey.com and Philippine Paradise Pages.